Have you been looking at colleges in Orlando, Florida? If you’re interested in obtaining a career-focused education in a growing field, such as Business, Criminal Justice or Nursing, learn more about Keiser University. Not all Orlando colleges are created equal – at Keiser University, students come first! Keiser University Orlando is conveniently located five minutes east of downtown Orlando at the intersection of Semoran Boulevard (State Road 436) and Lake Underhill Road. Admissions, administration, academic affairs, student services, and financial services departments are available to assist you at this location, which is staffed full time and offers a pleasant academic environment. Amenities include spacious classrooms, computer and medical labs, library with internet-enabled computer workstations, comfortable lounge area, student services information and career center, and on-site parking. Keiser University uses state of the industry instructional equipment which meets program standards and learning objectives. At the Orlando campus of Keiser University, students benefit from the philosophy of combining hands-on practical collaborative learning to their academic experience. At Keiser University “students come first”. From Interstate 95 north, take FL-528 (Bee Line Expressway) west. Follow the FL-528 for approximately 30 miles and exit to the right onto SR-436 (Semoran Boulevard). Follow Semoran Boulevard north for approximately 5.8 miles. Keiser University is on your left just before the FL-408 Expressway on the southwest corner of Lake Underhill Road and SR-436 (Semoran Boulevard). From Interstate 95 south, make a right at the fork where Interstate 95 meets with Interstate 4 (south of orlando Beach). Follow Interstate 4 west for approximately 45-65 minutes. You will pass the tall buildings of downtown. Exit Interstate 4 at SR-408 (also called the East-West Expressway) and go east. Proceed approximately 4 miles east through the large Conroy toll plaza. Take the next exit (#14) to the right. Follow the ramp onto Lake Underhill Road. Keiser University will be on your right approximately ½ mile ahead. From Florida's Turnpike north, exit at Interstate 4 (#259) east. Take Interstate 4 east for approximately 7 miles. Exit Interstate 4 at SR-408 (also called the East-West Expressway) and go east. Proceed approximately 4 miles east through the large Conroy toll plaza. Take the next exit (#14) to the right. Follow the ramp onto Lake Underhill Road. Keiser University will be on your right approximately ½ mile ahead. From Florida's Turnpike south, exit at SR-408 (also called the East-West Expressway) and go east. Follow SR-408 for approximately 15-25 minutes. You will see the tall buildings of downtown on your left as you pass through. Proceed an additional 4 miles east through the large Conroy toll plaza. Take the next exit (#14) to the right. Follow the ramp onto Lake Underhill Road. 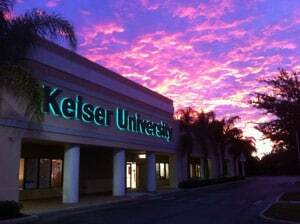 Keiser University will be on your right approximately ½ mile ahead.